The Most GRACIOUS and The Most MERCIFUL are two honourable names of Allah denoting that to Him all grace and mercy are attributed, in a way that becomes His Exaltation. The Most GRACIOUS is He whose Mercy prevails over everything in this world, and the Most MERCIFUL is He who distinguishes the believers with His Mercy in the hereafter. The Most GRACIOUS, is denotative of an attribute related to theExalted Self, whereas the Most MERCIFUL, is suggestive of the attribute’srelationship with those whom Allah has Mercy on, that’s why thename the Most GRACIOUS, is never mentioned in a transitive way in the Quranicverses. Allah, Praise and Glory be to Him, said, “And He isFull of Mercy to the Believers.” (AHZAB, 43),and He did not say: Full of Grace. AL-RAHMAN, the Most GRACIOUS, in Arabic, is a noun and an epithet. As an epithet, this name directly follows the name of Allah in, “In the name of God, Most Gracious, Most Merciful”, and as a noun it is mentioned in the Qur’an as an entire noun in, “God, Most Gracious is firmly established on the Throne.” (TA-HA, 5), “God, Most Gracious! It is He Who has taught the Qur’an.” (RAHMAN, 1, 2), “Say, call upon God, or call upon Rahman” (ISRAA’, 110). 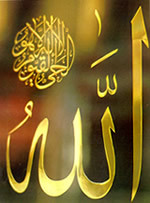 The two names AL-RAHMAN and AL-RAHEEM, are derived from the word rahma, which means mercy. The perfect mercy is endowing the necessitous with favour; the prevailing Mercy is endowing the necessitous and the non-necessitous. Allah’s Grace and Mercy are complete and prevalent; they are complete because He conveys His Grants to those whom He wishes to favour; as for their prevalence, Allah’s Mercy and Grace inundate the necessitous and the non-necessitous, the worthy and the unworthy with necessities, essentials and luxuries, in this world and in the hereafter. To man, mercy is not void of a heart-rending painful tendernessthat overwhelms the merciful person, as if by doing a merciful deed heis trying to overcome his own feelings of painful sympathy. Moreover,the merciful person may not be able to convey his help and grants to theneedy. Perfection lies in the perfect ability to convey and fulfill theneeds of the necessitous. From the word AL-RAHMAN, the Most GRACIOUS, one perceives a kind of Grace inaccessible to mankind’s power; Allah is the Most GRACIOUS, Most Beneficent to people; He endows them with a myriad of favours. He creates them, then He guides them to Faith and to all means of felicity, then He grants them His Bliss in the hereafter; the most perfect bliss is offered to them when they beam in brightness and beauty looking towards their Lord’s Countenance. That’s why AL-RAHMAN is more specific than AL-RAHEEM. Allah, Glory be to Him, says, “God, Most Gracious! It isHe Who has taught the Qur’an. He has created man, He has taught him speech”(RAHMAN, 1, 2, 3, 4). It was said that Allah is the Most GRACIOUS of this world and of the hereafter and He is the Most MERCIFUL of the hereafter. The name AL-RAHMAN can never be attributed to any one save Allah, but Raheem can be attributed to human beings. Prophet Muhammad, Allah’s Prayers and Peace be upon him, said, “When Allah created this world, He wrote there above His Throne (My Mercy precedes My Wrath) ” (Hadith). All disasters, diseases and the like that we perceive in this world are nothing but mercy although they may be covered and hidden from man. In other words, good is full of mercy and is meant in itself; evil maybe a blessing covered with a mantle of evil. Any evil that afflicts thehuman being is not meant in itself and this is one of the secrets of providence and fate that we are ordered to believe in, the good and evil of it, the sweet and bitter. Glory be to Allah Whose Mercy and Grace encompass every single thing, Glory be to the Most GRACIOUS, the Most MERCIFUL, He is Allah.